Around Christmas time, while making gingerbread houses, my friend Caryn and I were having that talk everyone seems to have about what an annoying let down New Years Eve always is. Instead of complaining we decided to collaborate on an epic magic dinner party that will bring luck in 2017. Since we only got down to planning two days before NYE, we weren't sure who could come, it may just be us, but we wanted enough lucky food and magic for anyone who felt like stopping by!! Menu: Stuffed Artichoke, Lentil Dip with Pita, Fig Spread and Goat Cheese, Brussels Sprouts with Bacon, Baked Cod, (not shown, Soba Noodles with Kale) Champagne Cake for dessert can be found below. These foods bring you health and wealth!! Upon entering, guests drink from our potion and make a wish for the New Year. 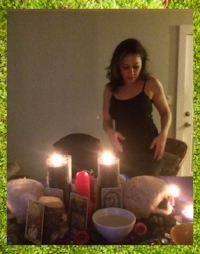 In the center of the table we built our magic alter, focused around tarot cards to bring us needed energies, and candles focused on healthy loving sexual relationships. At midnight we smashed a pomegranate and ate 12 grapes. Our walls were covered with projected footage from outer space and we were serenaded by the musical coven of Billie, Ella, Lena, and Sarah. Watch out, if you eat that cake too fast you might choke on a coin that will win you New Years!! I am so blessed to have Caryn as a magical friend and collaborator, and we were so happy to share with our guests, Shannon, Michael and Tiffany! If only we could shove green food down all our friends throats. Maybe next time! !